Cupcakes 'n Daisies: Just a little sewing going on . . . I've been doing some spring cleaning, office organizing, old document shredding and income tax preparing. It feels good to be organized but it left me with very little sewing time. One thing I did work on every now and then were my Village houses. This is Carrie's Village. My original goal was to make houses from scraps from my finished projects for 2016, having a quilt at the end of the year that represented all my work from this year. 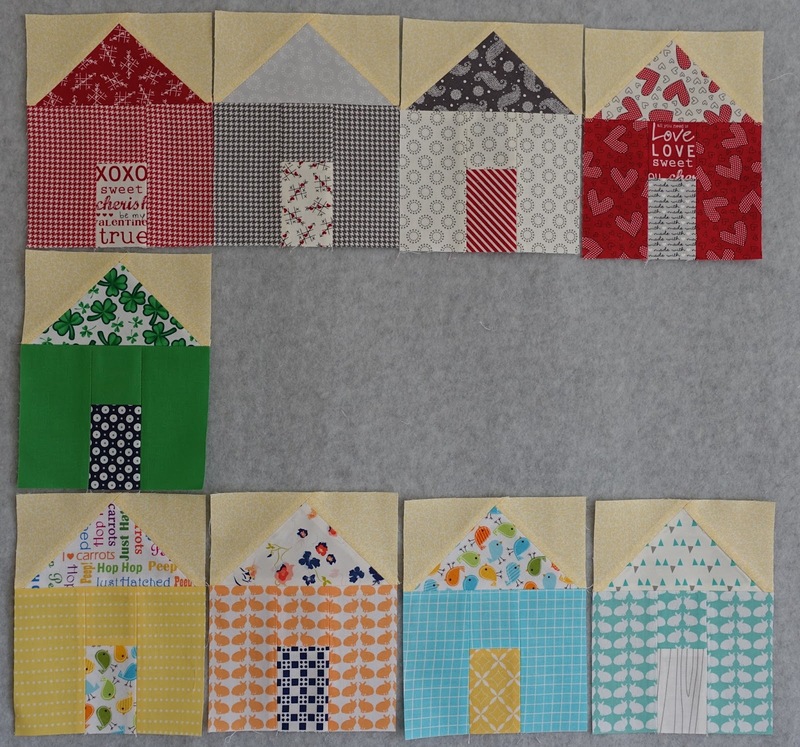 While that's a good idea, so far I've not had enough scraps to make more than 4 houses per project, not nearly enough, the pattern calls for 132 houses. If I finished 15 projects I would need 8 or 9 scrap houses. So I got to thinking how to supplement my Village. One idea is to add holiday houses. Here are my Valentine's Day, St. Patrick's Day, and Easter additions. This Easter house is my latest favorite. In addition to holiday houses, and project scrap houses, I figure I'll also add some houses from fabric that meant something from 2016, fabric I like but will never use for a project, and also using some of my all time favorite fabric. 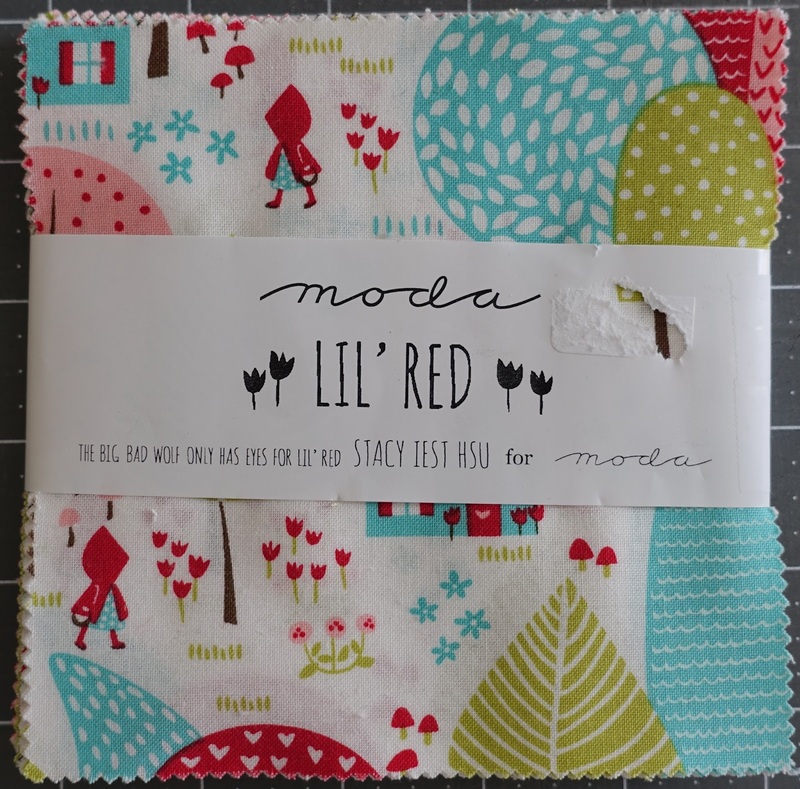 Lil' Red is an example of a family of fabric I like but probably wouldn't use in large project, perfect for my Village project. I won some Sewing Box by Gina Martin for Moda as a door prize and added some of that to the mix. As I'm piecing these assorted houses it occurred to me that maybe I was creating a hot mess, so I put all my pieced houses on my design wall. And I think I'm on track. I'm also feeling good about that light yellow background fabric, because it's always a sunny day in this village. Michele/Island Life Quilts and Sherri/A Quilting Life host a monthly sew along. Every month they pick a great project and every month I don't seem to make their parade. Their latest project is Village, and they're giving us two months to finish. I'm sticking with my 2016 theme, so I won't be done by in time, but you could join in! Your village looks great! I'm making this pattern for the parade but of course I'm changing the pattern and add some shops and bigger houses and grass. So far I have 2.5 houses ... need some more (I'm not making 132 houses just 62). It looks wonderful! 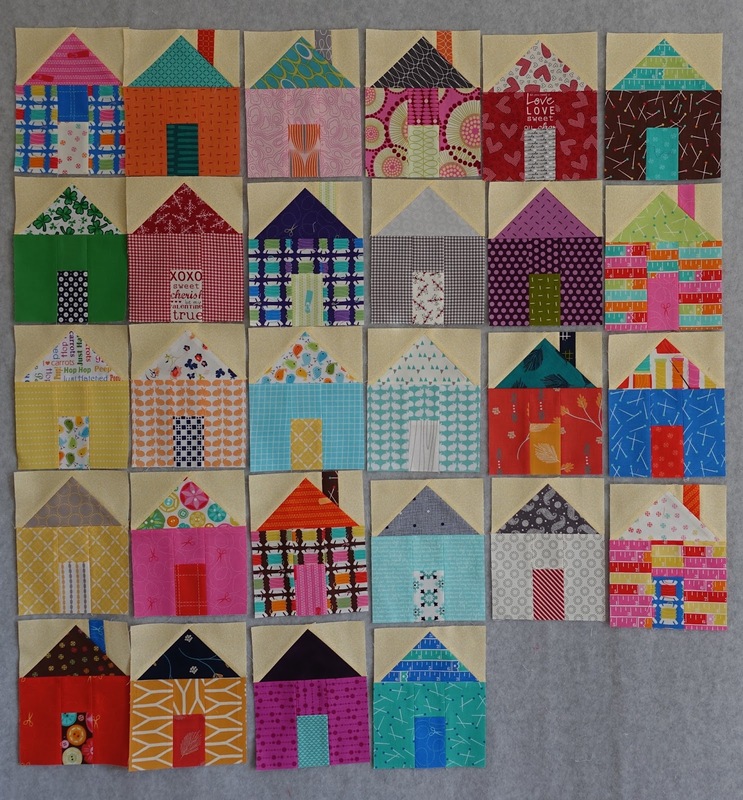 What a fun "memory" quilt you will have of all your past project and then some! The Fat Quarter Shop has some! Your first post about this inspired me to snap up the pattern. But it will be for me and that means it is behind some other must do things. I was also concerned about getting the houses right and then I realized I wanted a village of self-expression not HOA approved paint colors and figure it will work like a scrap quilt. It all comes together in the end! You are definitely on track. It is turning out lovely. 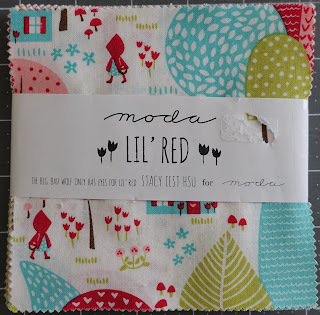 I recently picked up a bit of Lil' Red for a nap quilt for the grand baby. 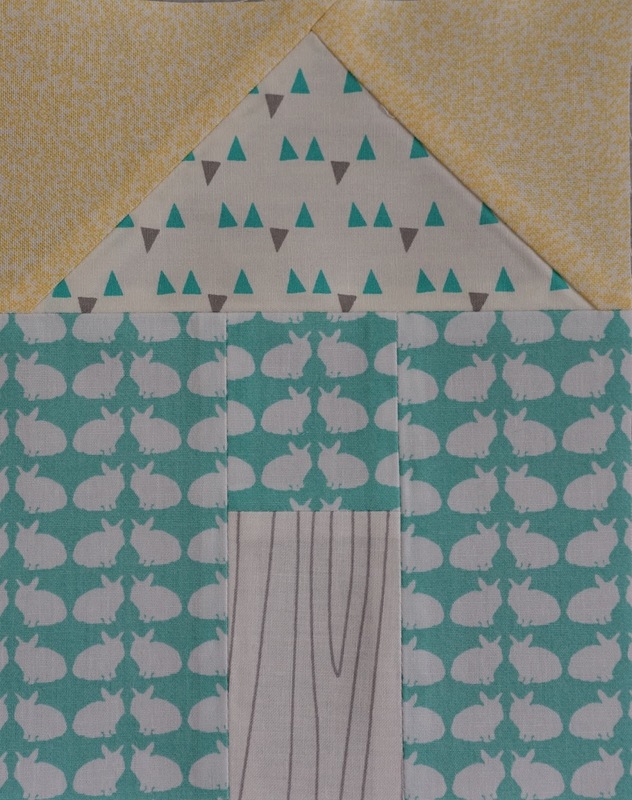 It is sooo cute but not something I would use outside of a quilt for the baby. It's been a while. Hope you are doing well. This quilt will be a beautiful keepsake! So cute!!! I wanna build a village!!! Adorable houses, Thelma. You are right about the yellow background. Perfect choice for sunny skies. Love your houses!!! What fun to have some holiday houses too. I would totally love to live in your neighbourhood!